4 DIGITAL SATELLITE, TERRESTRIAL or CABLE INPUT TUNERS. IP UDP and ASI INPUTS for feeding in local programs/services. Up to 48 SPTS outputs with program demux PID filtering. UDP or RTP/RTSP. Unicast or Multicast. IP SPTS 48 SPTS over UDP or RTP/RTSP. Unicast or Multicast. IP MPTS 4 x one to one RF or IPTV inputs to IPTV MPTS output passthrough. 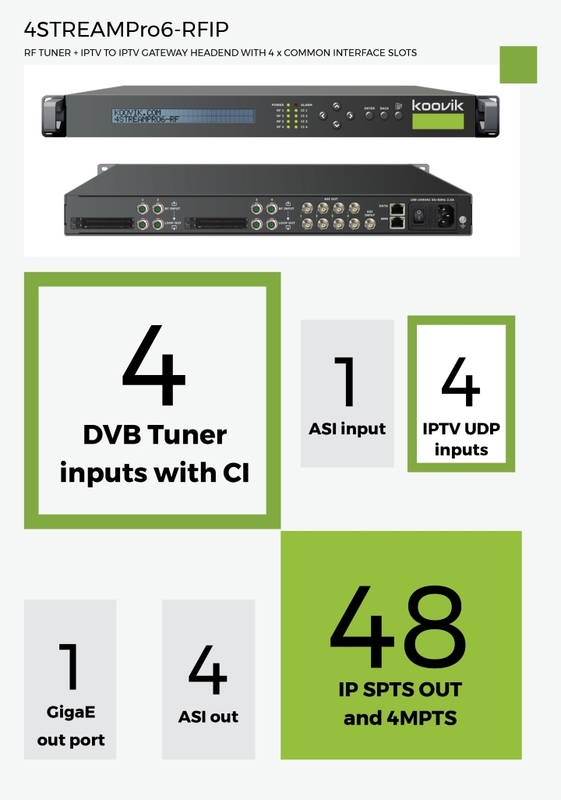 ASI 4 x one to one RF or IPTV inputs to ASI output passthrough. included 1 x mains cable, 1 x ground cable, 4 x RF loop cable, 1 x BNC male to BNC male.